Welcome to the new BMW Z4 range. I can guess that if you’re interested in one of the Z4 models, then you are another fan of the special Z4 styling, are in touch with the way this roadster performs and are aware of the way that these BMWs love the corners. The new Z4 is a competent roadster that boasts some aggressive styling that has a body language that’s all about speed. A lovely balanced car to look at, the rounded roof-line and flared wheel arches add to the car’s dynamic, sporty appearance. Three models are in the new BMW Z4 line-up, and all have their place. 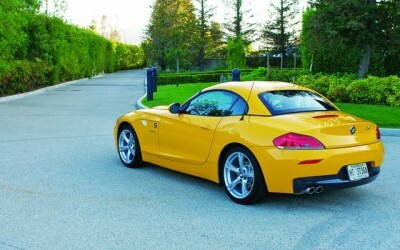 For me, the entry model, the BMW Z4 sDrive20i is the pick of the bunch. Why? The Z4 sDrive20i has a superbly attractive interior to match the gorgeous Z4 bodywork, and has the quality and features that the other two models can offer. It’s under the hood that a few less horses reside, however do remember that these horses are still of a thoroughbred breed and are capable of a very swift gallop. The lovely new Z4 chassis is as nimble and fun to drive as you’ll find anywhere, so the 2.0-litre, petrol engine always feels capable of putting down the power to the rear wheels in a flexible, unrestrained manner that aids the driving appeal of the Z4 sDrive20i. Hooked up to an eight-speed automatic transmission, the engine lives in its optimum zone, and hence the 0-100 km/h sprint time of under seven seconds is fast and immensely satisfying. All of the roadster fun that the BMW Z4 sDrive20i provides is all the fun I think I’d ever need, so it’s with this sort of driving pleasure in mind that one can overlook the more expensive Z4 sDrive28i and Z4 sDrive35is – granted they are more powerful, and even quicker. Interestingly enough, the Z4 sDrive28i has an up-rated version of the 2.0-litre found in the Z4 sDrive20i. In the engine bay of the Z4 sDrive28i is a 3.0-litre petrol engine that boasts 250 kW from the straight six-cylinder configuration. Each of the new Z4 models do offer plenty of driving features that enhance the driving pleasure. Both cruise control with a braking function and Park Distance Control (PDC) at the front and rear of the car are standard on all three versions. To use, the cruise control dials up easily, and is a great feature on a car of this type. It really does help you keep your speed legal so that our friends with the lights on the roof don’t pull you over for a chat too often! The added safety of the braking function on the cruise control provides assurance – particularly when traffic is busy. The rain sensing wipers are a cool feature, and the Kansas leather with SunReflective Technology built into the material not only looks stunning but offers support in all the right places. The seats are heated, which adds to the warmth, friendliness and appeal of the new Z4 cabin – just right for a cold morning start. All three Z4 models come with Bluetooth communications, a feature that boasts audio streaming and photographic technology. Internet access via your Z4 is a reality, while the navigation system has a nice clear 8.8-inch colour display in 3D mode. A BMW six-speaker sound system is found in the BMW Z4 sDrive20i that has MP3 connectivity. Superb sound tone and clarity is a feature of this audio set-up. If you do opt for any of the other two Z4 models, they come with an 11-speaker HiFi loudspeaker sound system. All models have USB connectivity and come standard with voice control. If you can spend a few extra dollars on the M Sport package for the Z4 sDrive20i, you can have the same amazing look that the Z4 sDrive28i and Z4 sDrive35is already have as standard. This includes the: 18-inch M light-alloy wheels with star-spoke styling, Aluminium Carbon interior trim, BMW Individual roofliner Anthracite trim, an M leather sports steering wheel, M Sport suspension and the M Aerodynamics package. I reckon it’s worth extra few bucks. Of the Mercedes Benz SLK, Audi TT, Mazda MX-5, Lexus IS250C, and Porsche Boxster equivalents… to name a few, a new BMW Z4 model takes some beating. Grab yourself a test drive and see why the new Z4 is so talented right across the board. For any more information on the new BMW Z4 or, for that matter, any other new car, contact one of our friendly consultants on 1300 303 181. If you’d like some fleet discount pricing (yes even for private buyers! ), we can submit vehicle quote requests out to our national network of BMW dealers and come back with pricing within 24 hours. Private Fleet – car buying made easy!